I dug deep and finally completed another challenge. 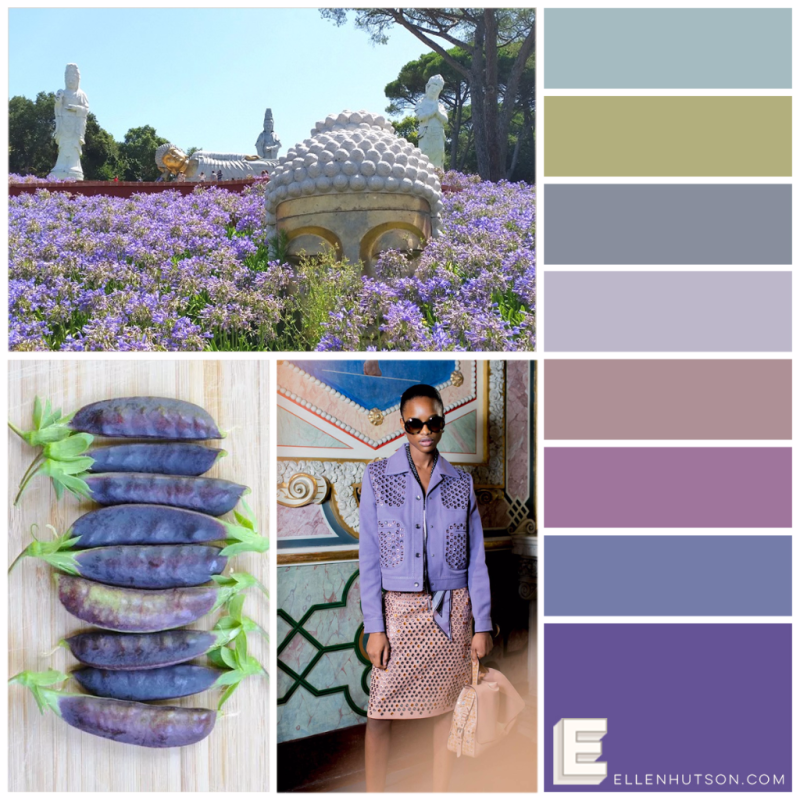 This is for the Ellen Hutson June 2018 Color Trend Challenge . In reality, I loved everything on the inspiration board, but thought I would execute something too close to the inspiration. So, I stuck to it being a color challenge. I cut a 5 inch square of white cardstock, and used my homemade wreath builder tool to build the wreath on my MISTI. After I was done stamping, I did trim 1/8th of an inch from each side, to give me space for the black mat. I have stashed it away for personal use. Supplies: Stamps – Clearly Besotted, Essentials by Ellen, paper – Neenah Classic Crest Solar White, Stampin’ Up! Basic Black, inks – Hero Arts Unicorn, Tim Holtz/Ranger Distress Inks Chipped Sapphire, Crushed Olive, Lucky Clover, Mowed Lawn, Shaded Lilac, Tumbled Glass, Wild Honey, Wilted Violet, die – Spellbinders, sequins – Pretty Pink Posh, embossing powder – Filigree Fine Art Powder white. Categories: birthday, card | Tags: card, Clearly Besotted, Essentials by Ellen, Essentials by Ellen Challenge, Hero Arts, Neenah, Pretty Pink Posh, Ranger, Spellbinders, Stampin' Up!, Tim Holtz | Permalink. I am arriving very late to the party – dangerously close to TOO LATE! 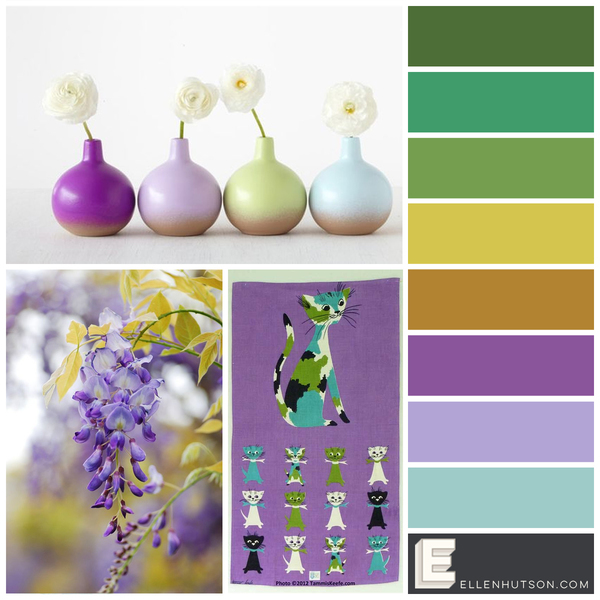 I was inspired by…the garden photo (top left). I used Rustic Botanicals to create my garden, and the only unique thing I did was to stamp the little 3 dot stamp 4 times to make the center of the large flower. The sentiment is from My Favorite Things (You Give Me Butterflies), and I liked how it filled up my white space. The ribbon is, of course, a “thank you” for an order from the Ellen Hutson store. Supplies: Stamps – Essentials by Ellen, My Favorite Things, paper – Neenah Classic Crest Solar White, Stampin’ Up! 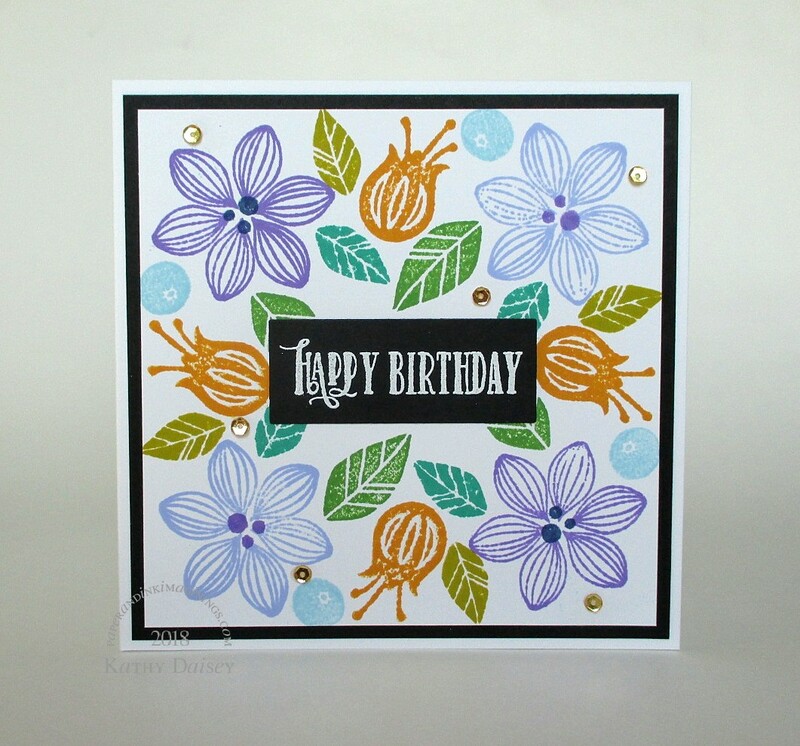 Pear Pizzazz, inks – Stampin’ Up! 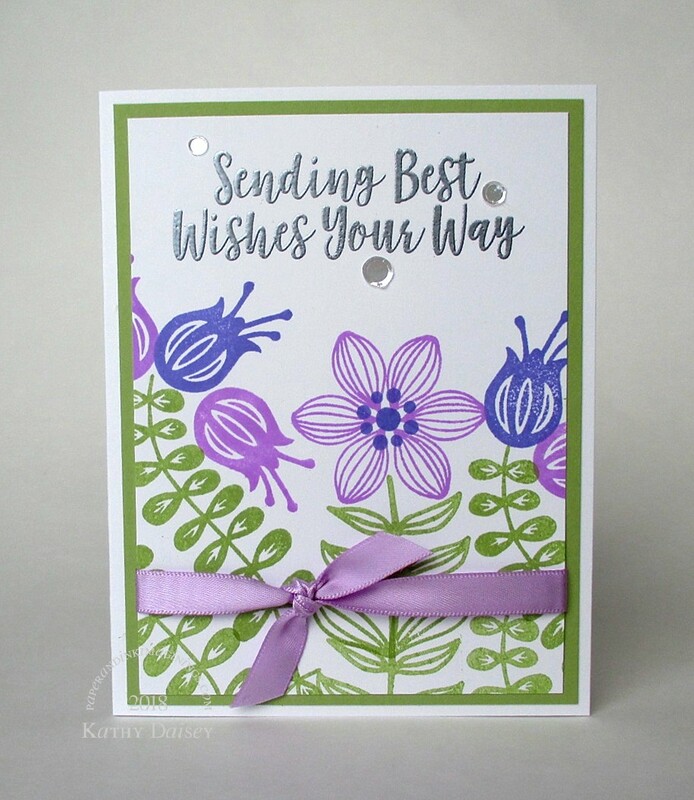 Lovely Lilac (retired), Orchid Opulence (retired), Pear Pizzazz, VersaFine Onyx Black, sequins – Simon Says Stamp, embossing powder – Ranger Silver Pearl, ribbon – Ellen Hutson. Categories: card, caring, encouragement | Tags: card, Essentials by Ellen, Essentials by Ellen Challenge, My Favorite Things, Neenah, Ranger, Simon Says Stamp, Stampin' Up!, Tsukineko, VersaFine | Permalink. HAPPY NEW YEAR!! May 2018 be a healthy and happy year for you! 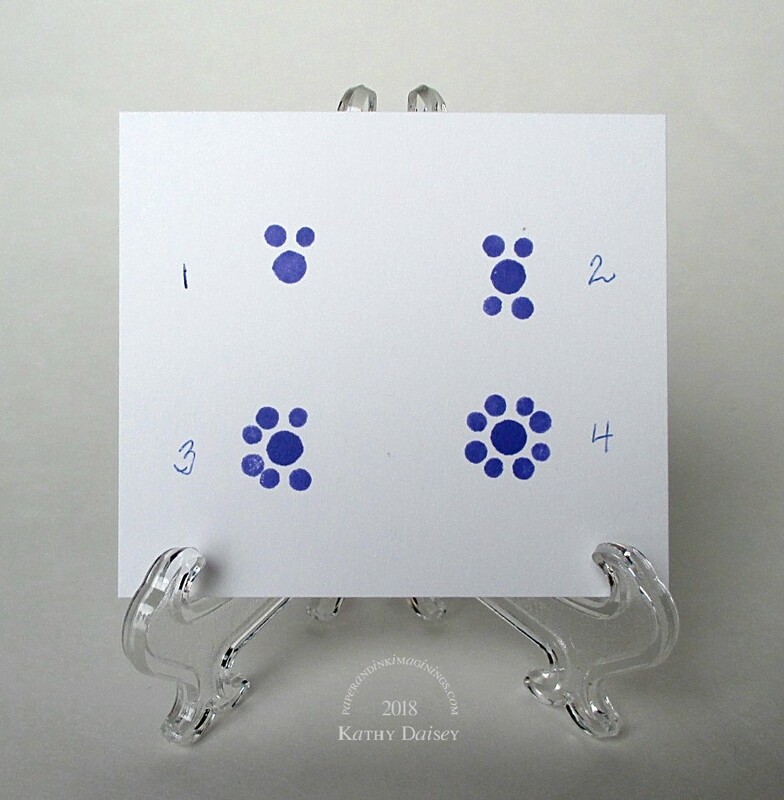 I am just squeaking under the wire for the Ellen Hutson December 2017 Pin-Sights Challenge. I am excited – Offspring3 gifted me a plethora of new stamps for Christmas, and 2 new (to me) Ellen Hutson sets were included in the bunch! (Be Strong and Rustic Wildflowers) YAY! I attempted to use all of the colors in Distress Ink form – I did stamp off the Salty Ocean and Wild Honey to make them lighter. And I liked the motion in the photo on the lower left – although, I don’t think I quite had enough space to capture the same effect. Supplies: Stamps – Essentials by Ellen, paper – Neenah Classic Crest Solar White, Stampin’ Up! Basic Black, inks – Hero Arts Unicorn, Tim Holtz/Ranger Distress Inks Mermaid Lagoon, Mowed Lawn, Picked Raspberry, Ripe Persimmon, Salty Ocean, Shabby Shutters, Spun Sugar, Twisted Citron, Wild Honey, die – My Favorite Things, sequins – Pretty Pink Posh, embossing powder – Filigree Fine Art Powder white. 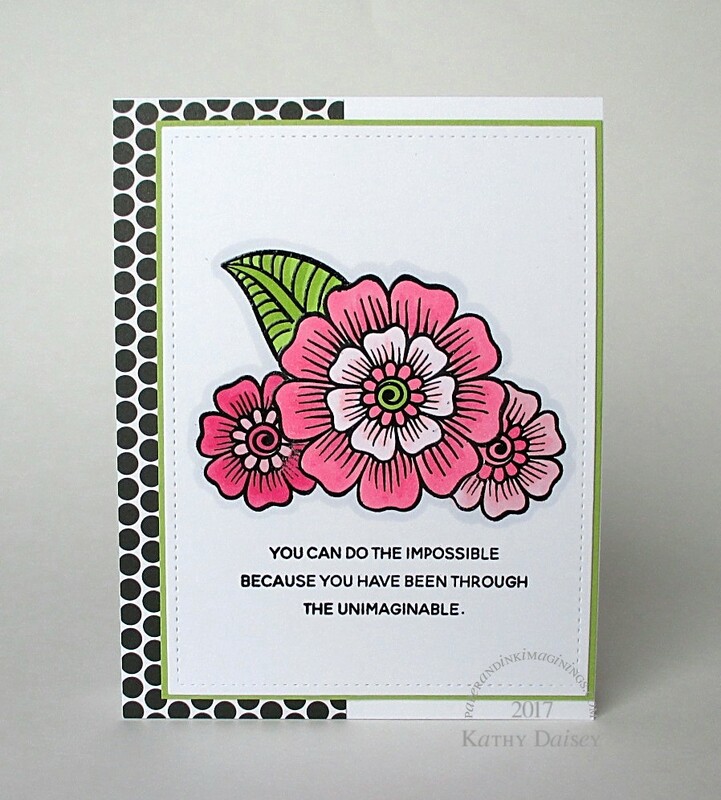 Categories: card, encouragement | Tags: card, Essentials by Ellen, Essentials by Ellen Challenge, Hero Arts, My Favorite Things, Neenah, Pretty Pink Posh, Ranger, Stampin' Up!, Tim Holtz | Permalink. It is December, so time to head on over to Ellen Hutson’s blog for the 12 Tags of Christmas with a Feminine Twist 2017 Challenge! I was also inspired by the tag on Day 5 made by Eloise Blue – the critter and the ink blended background. My vision – a night sky background, a fox sitting on a fallen tree with the moon rising behind. I counted my fallen tree and the sentiment as the vertical stripes. For my background, I blended 3 Distress Inks – Salty Ocean, Blueprint Sketch, Chipped Sapphire on Bristol card stock. I heat set the colors, and then flicked on some sparkly white watercolor from the Kuretake Gansai Tambi set. 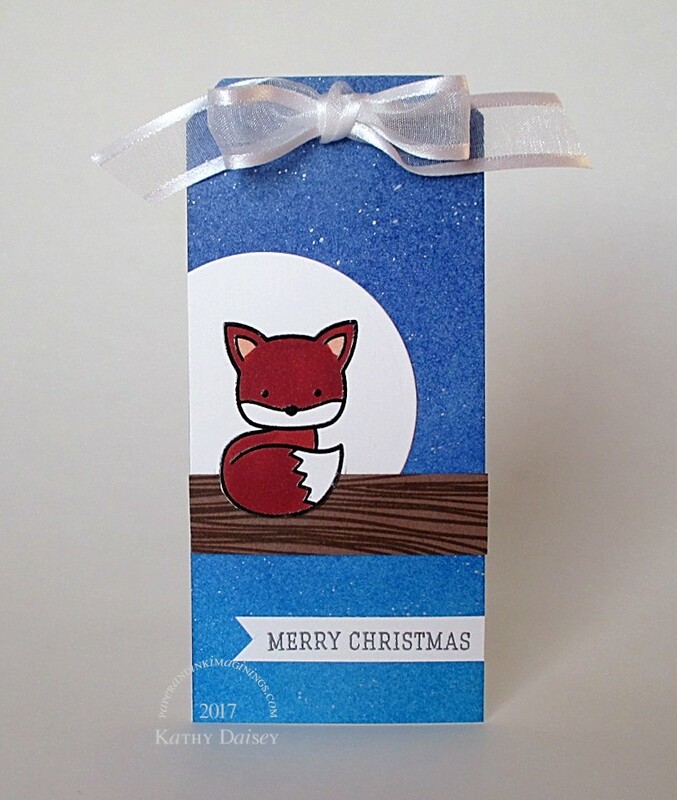 The fox was colored with Copic markers, and cut out first with the circle die. Then, I partially die cut the fox, to allow the fallen tree to be put underneath the tail. I added a sentiment and fussed with the ribbon for an hour. Supplies: Stamps – Hero Arts, Lawn Fawn, Papertrey Ink, paper – Neenah Classic Crest Solar White, Stampin’ Up! Close to Cocoa (retired), Strathmore Bristol, inks – Copic E11, E19, Tim Holtz/Ranger Distress Inks Blueprint Sketch, Chipped Sapphire, Salty Ocean, VersaFine Onyx Black, Vintage Sepia, dies – Lawn Fawn (fox), Spellbinders (circle), double hole punch – Stampin’ Up!, watercolor – Kuretake Gansai Tambi, embossing powders – Filigree Fine Art Powder clear, Ranger Silver Pearl, organdy/satin ribbon – ClearBags. Categories: gift tag, holiday | Tags: card, ClearBags, Copics, Essentials by Ellen Challenge, Hero Arts, Kuretake, Lawn Fawn, Neenah, Papertrey Ink, Ranger, Spellbinders, Stampin' Up!, Tim Holtz, Tsukineko, VersaFine | Permalink. 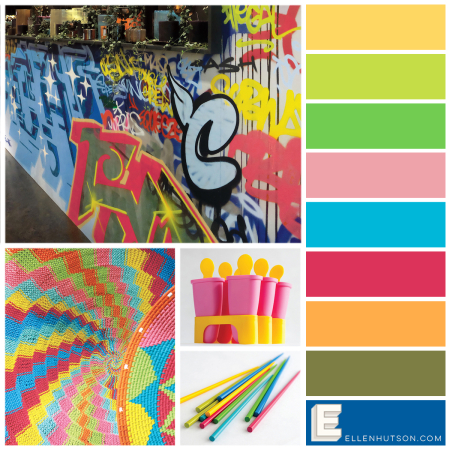 Here is my entry for the Essentials by Ellen October 2017 Mix It Up Challenge with Altenew. I combined Altenew’s Henna Elements set with a sentiment from Essentials by Ellen’s Courage set. My original color scheme did not include pink, but, OH…it is October, Breast Cancer Awareness month. 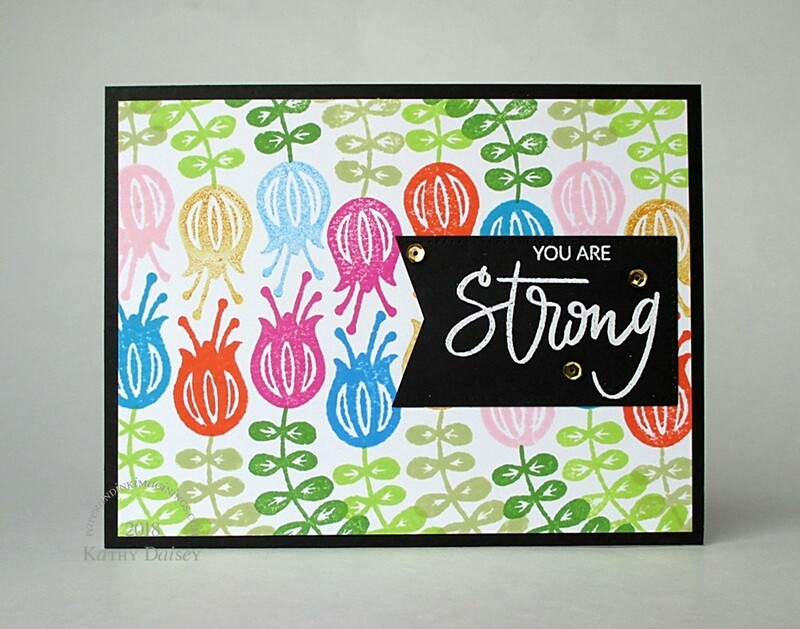 Supplies: Stamps – Altenew, Essentials by Ellen, paper – Avery Elle Neutral Collection, Neenah Classic Crest Solar White, Poptone Sour Apple, inks – Copic C1, RV0000, RV11, RV13, RV14, YG23, YG25, VersaFine Onyx Black, die – Lawn Fawn, embossing powder – Filigree Fine Art Powder clear. Categories: card, encouragement | Tags: Altenew, Avery Elle, card, Copics, Essentials by Ellen, Essentials by Ellen Challenge, Lawn Fawn, Neenah, Poptone, Tsukineko, VersaFine | Permalink. 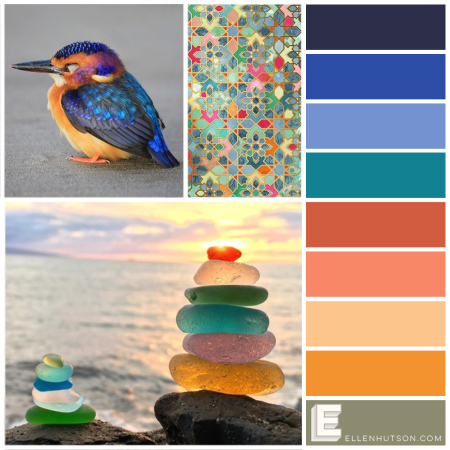 I am just squeaking in under the deadline wire for the Essentials by Ellen September 2017 Pin Sights Challenge . 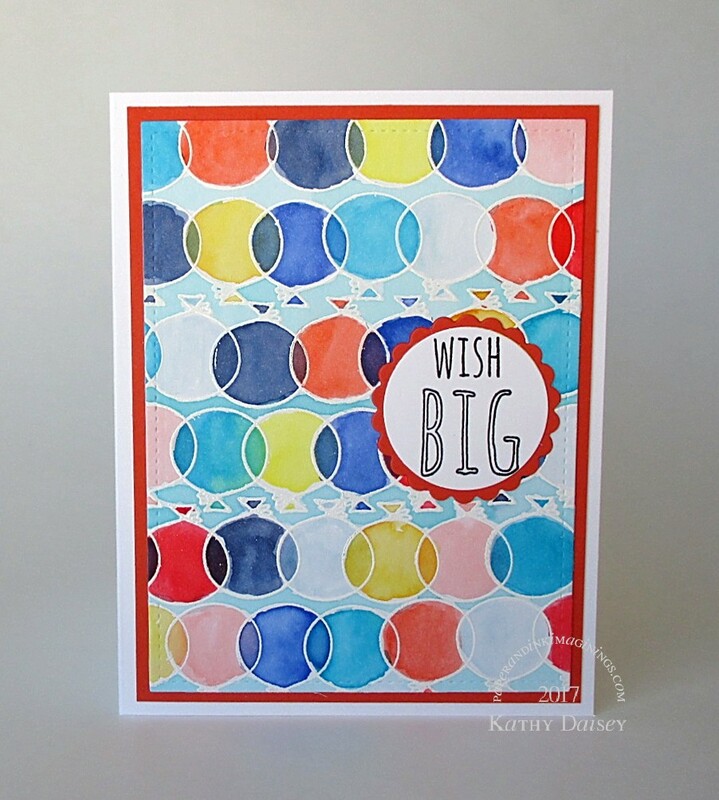 I created a mosaic using the small balloon from the Essentials by Ellen Wish Big stamp set, and I watercolored with Tim Holtz/Ranger Distress Inks. I was originally planning to go in a different creative direction (sea glass, lower left! ), BUT, I was very inspired by a trip to the Baltimore Museum of Art on Sunday. 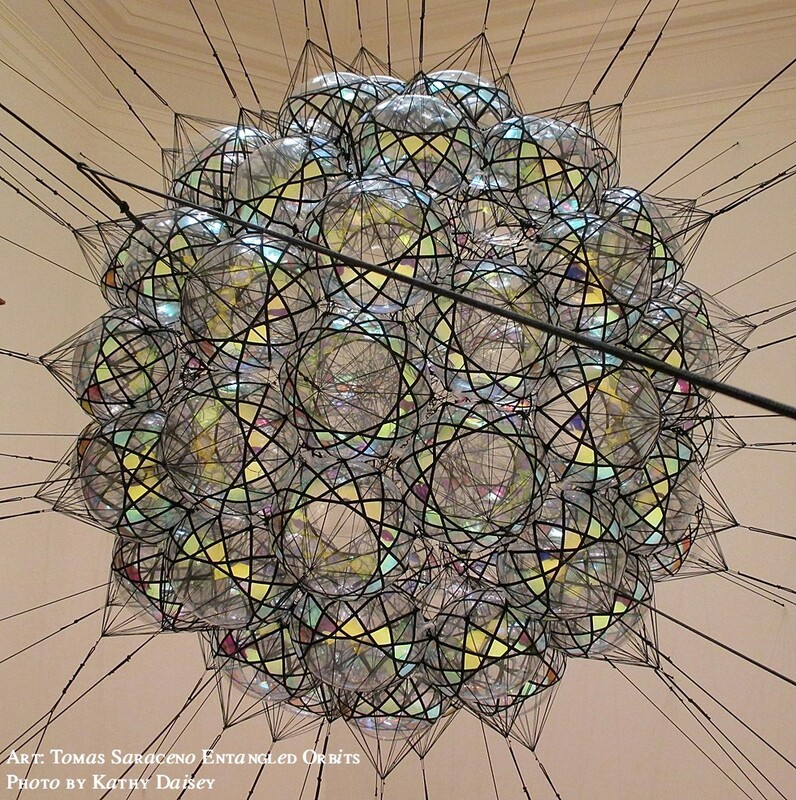 A new exhibit, Tomas Saraceno: Entangled Orbits opened October 1st. I did not go to the museum specifically for this exhibit (Offspring2 was looking for inspiration for a class assignement), but I was very glad I got to see it the exhibit in person. I don’t know the exact diameter of this piece – it was suspended in a small room, we had to step over the suspension cords to move around. I would guess over 5 feet in diameter? Supplies: Stamps – Essentials by Ellen, paper – Neenah Classic Crest Solar White, Ranger Distress Watercolor, Stampin’ Up! Tangerine Tango, inks – Hero Arts Unicorn, Stampin’ Up! Bashful Blue, Tim Holtz/Ranger Distress Inks Abandoned Coral, Blueprint Sketch, Chipped Sapphire, Mermaid Lagoon, Peacock Feathers, Ripe Persimmon, Squeezed Lemonade, Wild Honey, dies – Spellbinders, embossing powder – Filigree Fine Art Powder clear, white. Categories: birthday, card | Tags: card, Essentials by Ellen, Essentials by Ellen Challenge, Hero Arts, Neenah, Ranger, Spellbinders, Stampin' Up!, Tim Holtz | Permalink.